"An unusual fusion of two classic sandwiches, with surprisingly sweet and savory flavors." Combine ground beef, dried cranberries, garlic, salt, and pepper together in a bowl; form into 4 patties. Cook patties on the preheated grill until browned and cooked through, 5 to 7 minutes per side. An instant-read thermometer inserted into the center should read 160 degrees F (71 degrees C). Spread 1 tablespoon peanut butter onto the bottom layer of each roll; top with 1 burger. Spread 1 tablespoon strawberry jam on the top layer of each roll; sprinkle with 1 tablespoon goat cheese. 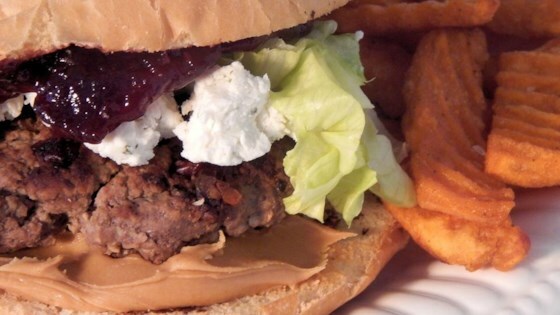 Place strawberry jam-goat cheese-layered bun atop burger to make a sandwich. See how to turn common pantry items into delicious vegetarian chili. Raisins can be substituted for dried cranberries. Grape jam can be substituted for strawberry jam. Poppy seed rolls can be substituted for onion rolls.